This week’s skillet is one of my favorites. It’s fun to make, easy and takes less than an hour start-to-finish. I think these toppings are really tasty, bringing some very robust flavors and an intriguing presentation. The toppings can easily be adapted to your taste. This is meant more as a concept recipe and I encourage you to experiment with new toppings and combinations. Sautéed toppings are nice here because we’re using the cast iron anyway. With the egg on top, you could swap the other toppings for bacon or sausage and green onions and make this a breakfast flatbread – yum! For this recipe I used a quality gluten-free pizza crust mix from my local Health Food store. All I had to do was add an egg and some coconut milk. Mixes can be really awesome, but it’s important to read the ingredients in any blended product. Gluten-free can be especially tricky and it’s important to know that “gluten-free” doesn’t mean healthy or preservative-free. Simple ingredients are best, though not everything you haven’t heard of is “bad” for you. Usually gluten-free mixes will have a blend of different flours, salt and something to provide the typical dough texture. One very common ingredient in gluten-free baking is Xanthan Gum. It’s the dried powder of a gel that’s the result of a fermentation process with a specific bacteria (named Xanthomonas campestris bacterium). It is used as an emulsifier, thickener and gives dough the elasticity that gluten would otherwise provide. From the research I’ve done, the studies I’ve read, I feel totally comfortable using Xanthan Gum in my baking. I have very high expectations, comparatively, when researching ingredients. The mix that I use is simple, clean and made from organic ingredients. It’s also a product from a local company which is, of course, even better. The dough mix makes this meal much easier to whip up and doesn’t demand a cupboard full of different flours and other ingredients. Gluten-free pizza dough – enough for a 12 inch pan. You’ll need the additional ingredients required for your mix. Cheese – I used an old cheddar this time because I love it’s richness. Feta would have been amazing too. Preheat oven as directed on your mix (usually 400F). Follow the instructions on the package and create your dough. “Caramelize” the onions: Turn the stove to medium-low heat and put a Tbsp of coconut oil into a large cast iron skillet. While it’s heating, slice your onion. Add the onion to the skillet, along with a Tbsp of olive oil. Cook the onions slowly, stirring every couple of minutes. You want to cook the onions long enough that they become light brown, very soft and take on a sweet flavor. We aren’t aiming for crispy, so be sure to keep the heat lower and to add enough oil so that there is a gel-like sauce that accompanies the onions, protecting them from heat and providing a bit of moisture to the flatbread later. Transfer the onions and most of the oil to a bowl. Leave a bit of oil, rather than re-greasing the skillet for the crust. 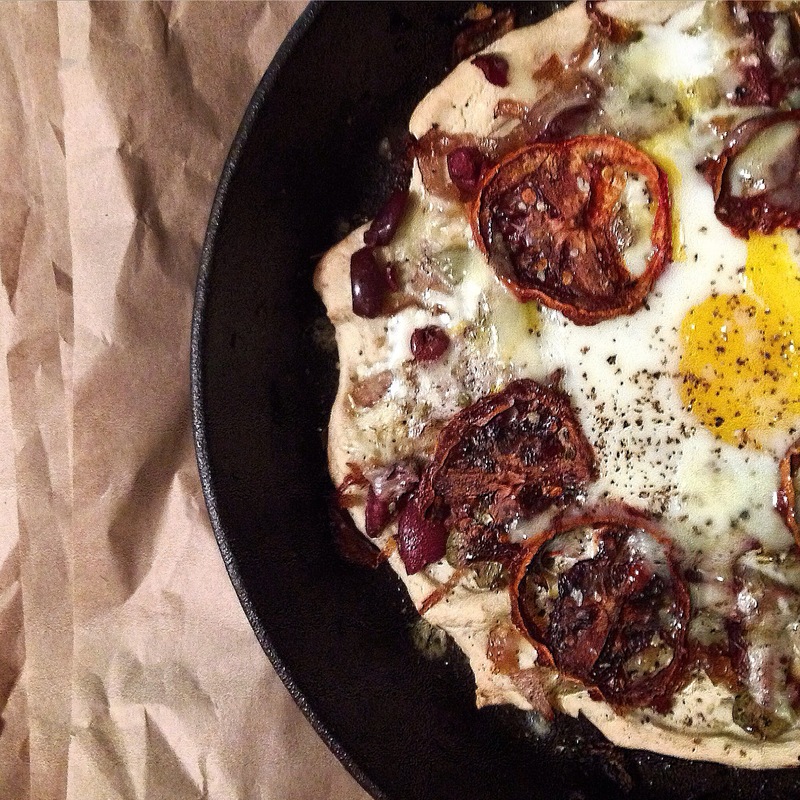 Put your crust dough into the skillet. I kept mine flat, but you can mold thicker edges if you’d prefer a more pizza-like outside crust. Once it’s the shape you’d like, put it in the oven for about 10 – 15 minutes. I don’t know what your exact crust consists of so please keep an eye on it. Gluten-free crusts can often be gummy and uncooked in the center, this step avoids that unpleasantness. While the crust is pre-baking cut up your olives, if necessary, and grate your cheese. I did my cheese in flakes to give more variation in each bite. Remove the crust from the oven when it is starting to harden, but not brown. Poke a few wholes in it with a fork. Leaving the very center of the flatbread a little topping-sparse, sprinkle your onions over the top, including the oily sauce. Next sprinkle on the olives, 3/4 of the cheese and press in your tomatoes. Sprinkle all with oregano and salt and pepper. Reduce the oven temp. to 350F. Put the skillet back into the oven for about 8 minutes. We want to melt the cheese but not burn anything. Remove from the oven when the white is cooked, about 10 minutes and enjoy your delicious gluten-free skillet flatbread. Happy New Year to all of my treasured readers near and far. I wish each of you health & happiness for this bright New Year.